Introduce the Ruff Wear Webmaster harness to your dog properly and just the sight of it will tell your Tripawd that good times are ahead. But introduce a dog harness incorrectly, and your dog will run, freeze or cower whenever he sees it. If you’re thinking about buying a Webmaster Harness for your three-legged dog, here are some tips for a proper harness introduction. Don’t stand or hover over your dog the first time you try the harness. Above all else, never, ever force your dog to wear a harness (or other gear) right out of the package. You especially want the first time to be a pawsitive experience. Many dogs see a human standing over them as a dominant behavior and will resist a forceful attempt to put gear on their body. The feel of the harness fabric and straps around his torso can also be construed as dominant behavior. We’ve heard that some Greyhounds have a tendency to freeze as soon the harness goes on, so be sure to make it fun and rewarding! 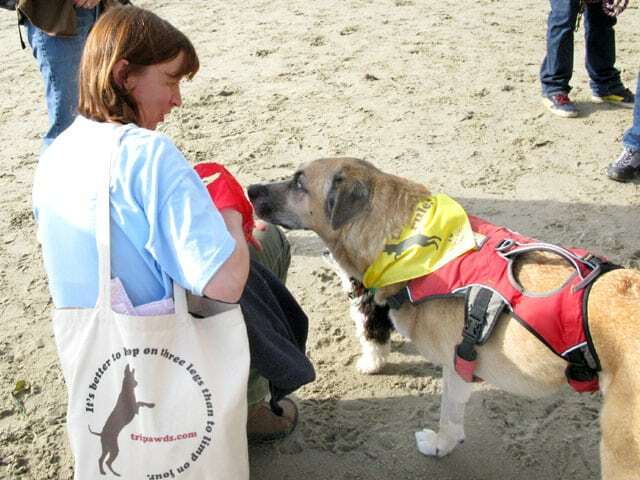 A good dog harness introduction is easier if two people are available; one to feed treats and the other to maneuver the harness around and onto your dog. But as you can see in this fun and helpful YouTube video by ElliotDMDS, one person can introduce this harness quite easily! NOTE: The harness used in this video is not a Ruff Wear Webmaster, but the procedure used for introducing it to your dog should prove helpful for any harness. Extend all harness webbing straps completely out until the end of each strap reaches the corresponding buckle. Keep in mind that strap ends may be tucked inside padded strap sleeves. Place the harness flat on the ground with the top (outside) of the harness facing up. Set small treats on top of the harness. Let your dog eat them and sniff away! Continue placing treats on the harness and allow your dog to stand on and around it. Slowly move the harness up, down around your dog’s body while feeding treats. Take a break! You may want to wait a day until you try the next steps. In between each one, feed treats and show your enthusiasm! Tell your Tripawd that the harness means FUN! Feed your dog treats while gently placing the front opening of the harness over your dog’s neck. Slowly remove the harness, and repeat the above step a couple of times. With the harness on your dog’s neck and back, support your dog while gently maneuvering the front right leg through the right leg loop. Skip this if your dog is a front right Tripawd. Continue feeding treats while slowly wrapping the chest strap around your dog’s stomach. Close buckle. Proceed to wrap the belly strap around your dog’s stomach. Close buckle. Tighten excess strap webbing by pulling it through the elastic band. Slide excess webbing back into the padded strap sleeve. The upper front chest straps can be tightened or lengthened just by sliding the plastic buckles away or toward the harness body. Grab a leash and go for a walk! NOTE: Many customers neglect to notice that the three front straps can be adjusted. Be sure to extend or tighten these before assuming the harness is the wrong size. You can attach your dog’s leash to the steel D-ring if you choose. This is a great way to evenly distribute weight on a Tripawd. 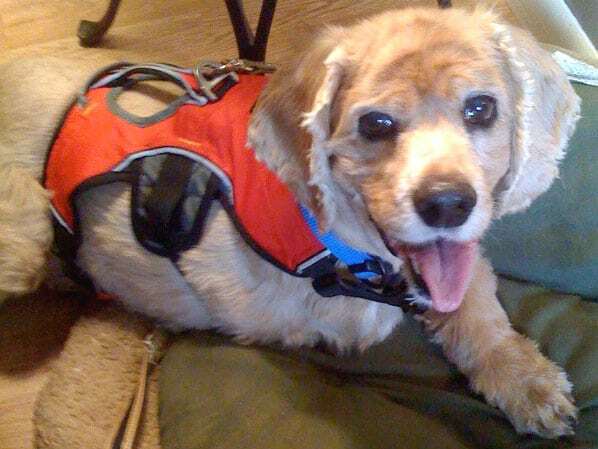 in our complete Webmaster Dog Harness Review. Where Do I Begin with Doggie Physical Therapy?